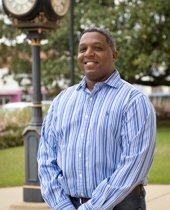 Deric Horne is a lifelong resident of Neshoba County and resides with his wife, Tomekia, and their son, Dalen, in the Longino community. Deric is well experienced with over 10 years in real estate sales and 15 years as an investor. Deric enjoys all aspects of real estate, whether working with a first-time homebuyer or investor and is knowledgeable in the foreclosure market. Deric and his family are active members of their church, The Sanctuary of Philadelphia. He enjoys spending time with family, hunting, and fishing.